We continue our popular and successful series devoted to the biggest chart records of each calendar year in the early chart era as we focus on 1942, the second full calendar year of the Billboard Best Sellers chart – the chart was launched in July 1940. This great value 85-track 4-CD set comprises every record which appeared in the Best Sellers Top 10 during the year – the chart was restricted to ten places in those days. The big names of the swing era were very much in evidence, and the year started with Glenn Miller’s “Chattanooga Choo Choo” at No. 1 and finished Dinah Shore’s “Dearly Beloved” with occupying the top spot. In between, a host of other big names made their presence felt - Jimmy Dorsey, Harry James, Tommy Dorsey, Bing Crosby, Benny Goodman and others - alongside many highly collectable lesser-known records by some artists we don’t hear too much about these days like Kay Kyser and Alvino Rey. 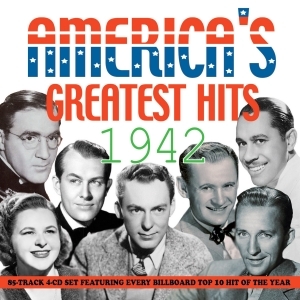 It makes for an intriguing and very entertaining musical snapshot of a year when the USA had become fully embroiled in WWII and there were plenty of patriotic and sentimental wartime hits to give a period flavour, with prolific hitmaker Glenn Miller epitomising that particular strand. It includes a 10,000+ word booklet with a commentary on every record as well as full discographical and chart information. 3 Piano Concerto In B Flat Freddy Martin & His Orch. 6 You Made Me Love You Harry James & His Orch. 9 A String Of Pearls Glenn Miller & His Orch. 17 Blues In The Night (My Mama Done Tol' Me) (Part One) Jimmie Lunceford & His Orch. 3 Blues In The Night (My Mama Done Tol' Me) Cab Calloway & His Orch. 5 A Zoot Suit (For My Sunday Gal) Kay Kyser & His Orch. 8 Jersey Bounce Benny Goodman & His Orch. 9 I Don't Want To Walk Without You Bing Crosby with John Scott Trotter & His Orch. 10 Somebody Else Is Taking My Place Russ Morgan & His Orch. 14 Sleepy Lagoon Harry James & His Orch. 19 Miss You Bing Crosby with John Scott Trotter & His Orch. 21 Jersey Bounce Jimmy Dorsey & His Orch. 1 Johnny Doughboy Found A Rose In Ireland Kay Kyser & His Orch. 7 Kalamazoo Glenn Miller & His Orch. 9 He Wears A Pair Of Silver Wings Kay Kyser & His Orch. 10 Strictly Instrumental Harry James & His Orch. 12 Take Me Benny Goodman & His Orch. 13 Idaho Benny Goodman & His Orch. 14 My Devotion Jimmy Dorsey & His Orch. 17 I Left My Heart At The Stage Door Canteen Sammy Kaye & His Orch. 18 Amen Woody Herman & His Orch. 19 My Devotion Vaughn Monroe & His Orch. 20 My Devotion Charlie Spivak & His Orch. 1 I Left My Heart At The Stage Door Canteen Charlie Spivak & His Orch. 7 Praise The Lord & Pass The Ammunition Kay Kyser & His Orch. 10 When The Lights Go On Again (All Over The World) Vaughn Monroe & His Orch.